Celebrate your love for the author of Pride and Prejudice with our graceful Jane Austen Silhouette Necklace (handmade by a South Carolina-based artist we discovered when she created custom wedding-cake toppers for one of our editors)! 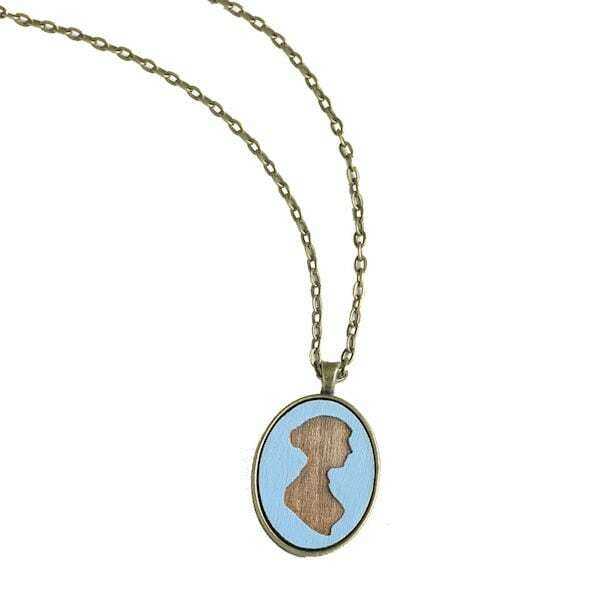 Austen's elegant profile is laser etched into an oval basswood pendant and accentuated with a pretty periwinkle-blue background. Setting (measuring 1¼" tall) and 24" oval link chain (with standard lobster clasp) are both zinc alloy with antique brass finish.